How to watch the Golden Joystick Awards 2018 | What Hi-Fi? The What Hi-Fi? Awards may be over, but Awards season continues, and next up is a big one if you're in to games. 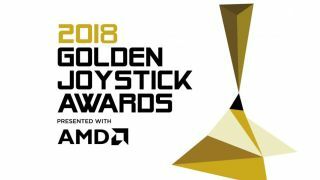 The 36th Golden Joystick Awards, organised by our sister site GamesRadar+, take place on 16th November - and you can watch the event live on Twitch. The awards are being held this Friday 16th November at London's Bloomsbury Big Top, and hosted by comedian Danny Wallace. The pre-show will begin at 15:00 GMT / 7:00 PST / 10:00 EST and will be hosted by GamesRadar’s James Jarvis, Zoe Delahunty-Light and Brandon Saltalamacchia. There are 23 categories, including Best PC Game, Best VR Game, Ultimate Game of the Year and Lifetime Achievement Award, with 18 of them voted for by the public - and more than 500,000 votes have been cast. “This year’s Golden Joystick Awards live show will be bigger and better than ever, with more exclusive interviews and video reveals, plus the chance to find out which games the public has chosen as their favourites of the year," said Dan Dawkins GamesRadar's global editor-in-chief.